Input operators in the Democratic Republic of the Congo (DRC) receive electoral kits from the office of the Independent Electoral Commission. The material will be deployed to the different electoral centres in Goma. According to the Office of the UN High Commissioner for Human Rights (OHCHR), DR Congo has seen a wave of protests expressing concern that President Joseph Kabila will refuse to step down from office today (19 December) when his second and final term under the current constitutional arrangements come to an end. Elections to replace him have been delayed until 2018. On 1 December, five Lucha members and a journalist were arrested in the vast country’s eastern Ituri province while they were preparing a press conference to launch the campaign. The journalist was later released, but the other five are still in detention facing jail for alleged incitement of misconduct toward the authorities. 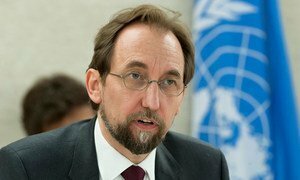 On Saturday, the UN High Commissioner for Human Rights, Zeid Ra’ad Al Hussein had also expressed deep concerns over the situation in the country and called on the authorities, in particular the security forces, “to take all necessary measures” to guarantee the rights to freedom of association and of peaceful assembly. Furthermore, according to reports, DRC authorities have also ordered all Internet Service Providers (ISPs) to block access to socialmedia websites. The block was planned to be enforced from Sunday evening. “A measure of this broad scale suppresses the right of the people of DR Congo to access information and to communicate. This right is particularly essential during times of public debate and democratic choice,” the experts underlined. The United Nations human rights chief today said he is “deeply alarmed” at a planned Government shutdown of social media in the Democratic Republic of the Congo (DRC) from Sunday evening, ahead of the end of President Joseph Kabila's mandate, coupled with a continuing ban on demonstrations by civil society and the opposition.